What does the market look like for gold and silver this year? See what the predicted gold and silver rate will be for 2018. Across hundreds of years silver and gold have had a particular attraction to people looking for what could be considered a "universal currency." In a digital age, with cryptocurrencies having a particular attraction for investors, will these precious metals continue to hold their values? Investors, professional and those looking to build their retirement savings, are evaluating the future of their involvement in these time honored resources. What will the future hold? Let's take a look at what the gold and silver rate in 2018 is predicted to be. There isn't a simple formula for determining a gold and silver rate. Instead, a number of factors have to be considered. These include (of course) the current known supply and the understood demand. Trade groups take these factors into consideration to "fix" (or set) a price. This fixed price is set twice a day, once in the morning and once in the late afternoon. This is not to say that this is the only price that governs the gold and silver rate. Consider that an "official" price. Many smaller dealers, sellers, and traders will have a price on one side or the other of the fixed price based generally on their current needs and the nature of the market area that they buy and sell in. As with any investment, people look toward the future to try and gauge accurate rates for a particular commodity. This of course puts some degree of speculation into the mix, but then again, that's really what investing is right? In the case of silver, it's important to consider technology advances. Solar energy, RFID technology, and switches are just some of the charging technologies that rely on silver in some form. While it's important to recognize that silver plays an important part in each of these components, it's equally important to discover why. That's because you want to be aware of where silver has become an irreplaceable element in its' use and where it does a serviceable job but can be replaced as this would bring the demand (and therefor the price) of silver down. This same type of search must be done with gold. Gold finds itself in the same position as silver, being an invaluable piece of a number of existing and emerging technologies. For example, it's estimated that every cellphone contains 50mg of gold (through pieces like wiring). With the cellphone industry in a constant state of upgrade and then growth, this puts an ongoing need for gold. 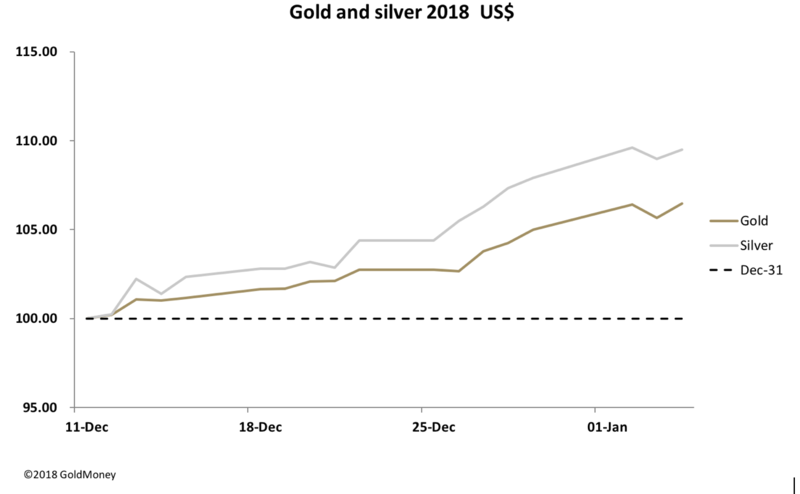 Experts are taking the above factors into consideration and predicting a somewhat flat year for gold and silver rates in 2018. This static growth follows the pattern of the past few years. 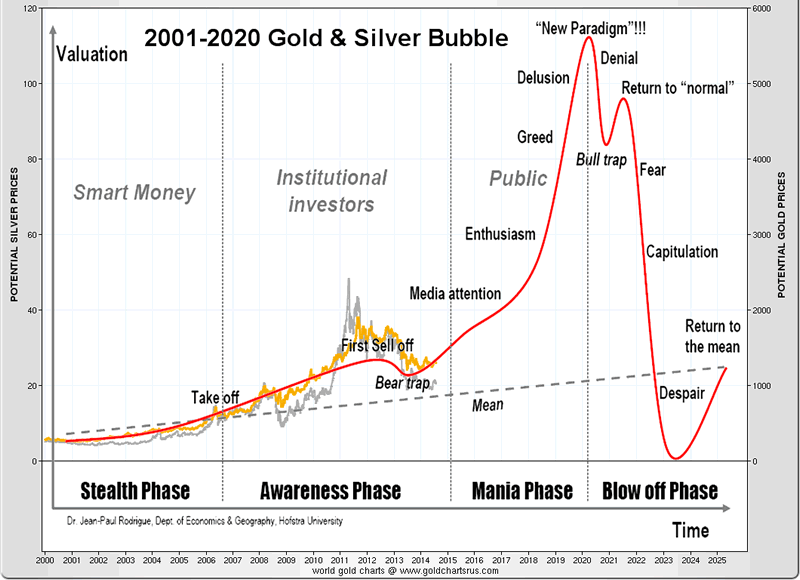 Beginning in 2015, gold has been on a parallel path. Yes it's had some minor ups and downs, but overall the range it has been in has been consistent. This has been right around the $1200 an ounce range. Down from nearly $1400 in 2014 yet up significantly from the mid-70's price of $200. For it's part, silver is currently seeing a valuation of $16 an ounce. That's down four dollars from just two years ago! In 2012, silver peaked at nearly $50 but has made a steady descent since that point to the mid-range level it currently sits in. This historical data and current belief in upcoming trends have led evaporators to make some long-term predictions. (Please note that this is intended to provide information only and is not intended to be used as an investment guide.) Let's look at one month - February - across the next several years. In Feb 2018, it's predicted that silver will be selling at $16.97 an ounce. In Feb 2019, this number is estimated to dip to $16.53. Feb of 2020 may see a climb to $17.43 while 2021 could see a significant drop to $14.82. Gold could undergo the same roller coaster valuations across the next several years as well. Looking again at February, in 2018 it's predicted that gold will be available for $1347 for 1 troy gram. In 2019 (Feb) that number could climb to $1462. In 2020 there is predicated to be another jump to $1594. Much like silver though, 2021 will see a decline in the rate of gold, down to $1332. Note that all of the above numbers are for 1 troy ounce. Gold also trades in grams, although those numbers across the same period are equally volatile. It's easy to see that the only certainty in the gold and silver rate is its' uncertainty. While experts do their best to make accurate predictions based on their experience and understanding of the market, those are just predictions. Because of this uncertainty, some investors have chosen to work in what's known as futures. This allows one side to essentially "lock in" a price on gold, silver, or both. There is no certainty of course in these futures amounts but there is some comfort for an investor to know that they are covered if the market for gold or silver dropped out. Of course, if a gold or silver rate went higher then the future contract, that's when the disappointment of investment clicks in. There are any number of opportunities for people to get involved in the gold and silver market. Some people watch the rates because they have some old jewelry or scrap kitchenware that they want to sell and they are holding out for the "best price." Others are what might be known as "pure investors" who have reviewed all of the factors and believe that they can make money on gold and silver. Regardless of the reason you're watching the rates, it's important to know what you are looking at and how to decipher historical data and future predictions. That's where an expert can help. When you're ready to take a turn with these precious metals that have fascinated humans and been prized components of wealth for thousands of years, we are here to help.